French Boutis is an ancient form of French quilted needlework. Traditionally it is all white on white, but I adore the bright Provencal colors and created this SCISSOR CASE to entice people to learn this art. It is done with a small running stitch and a back stitch on two pieces of batiste, then yarn is drawn through the channels to give it a raised relief. I am working VERY hard to bring this art to the USA. 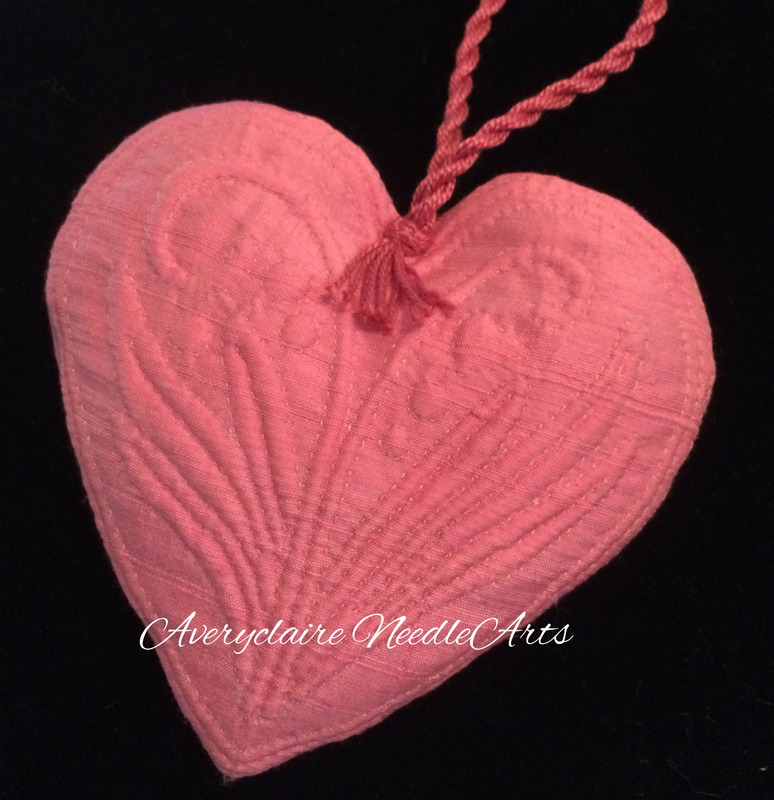 I teach classes for a minimal fee and sell beginner kits on my ETSY AVERYCLAIRE page. The kit is available in a variety of colors (8 different colors) and includes everything you need to complete one scissor case. Please tell your quilting and needlework groups! UPDATE: This pattern calls for a silk covered snap. 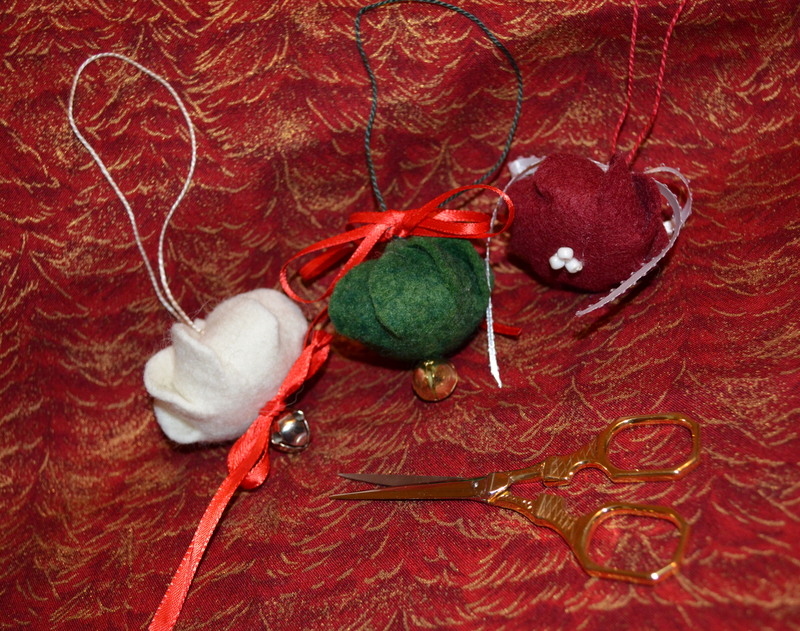 I have provided the materials in the kit, but I put the tutorial at the top of this page for all to use. What have I been doing for the last four months? Well, a lot actually! Thanks for being patient with me and thank you for always coming back to see what’s new! 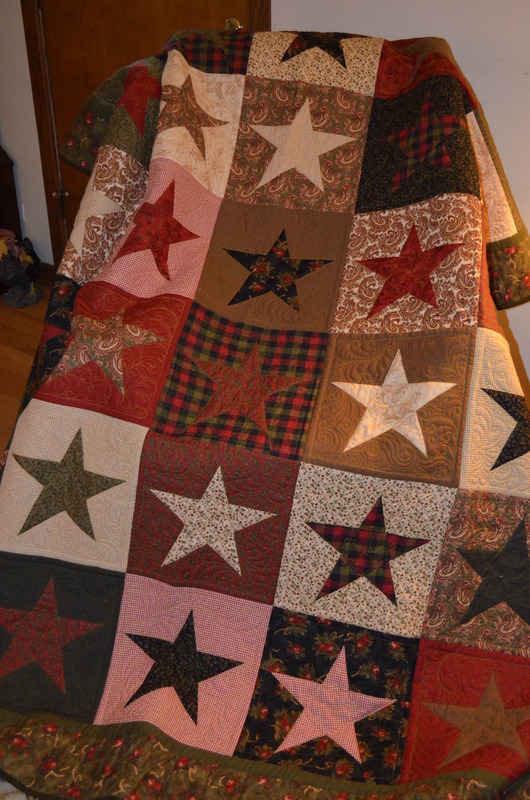 I finally had my star quilt quilted by Jamie Wallen in Michigan City, IN. Didn’t realize I wouldn’t get it back for four months, but I do love how it is quilted! He did a beautiful job. And it is now one of my favorites! 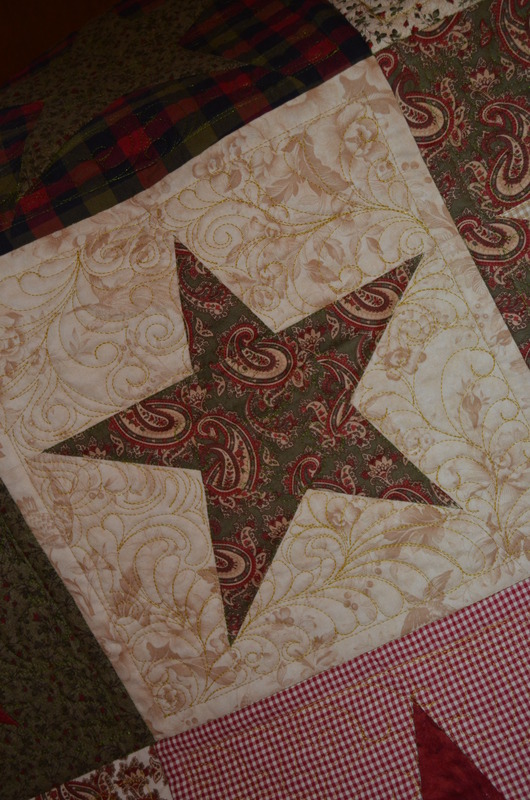 You can see the lovely feather quilting done around each star! 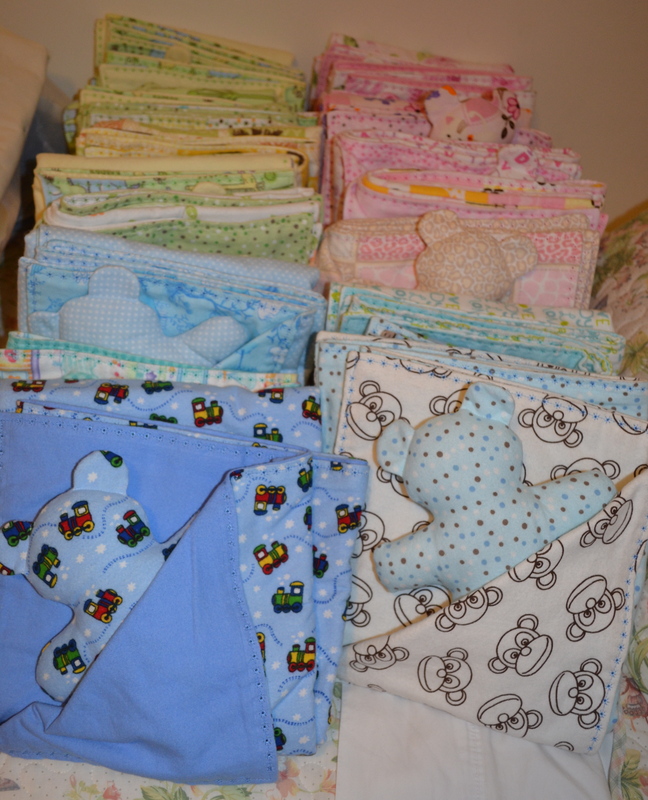 While that was out being quilted, I made 20 more baby blankets with teddy bears for our Quilters’ Plus Holiday Boutique the first weekend in November. I have them all lined up and waiting to put double ribbons around each teddy bear. I have made these for many years. The proceeds of these blankets help support my quilt guild (and I get some money back as well). It’s a lot of work to make so many, but voila! C’est fini! 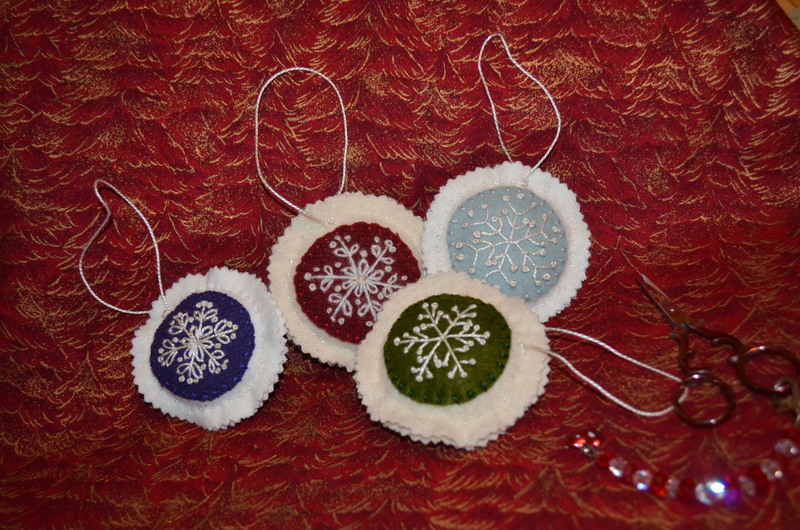 I also made some wool Christmas ornaments to sell at the same Holiday Boutique, but 100% of the proceeds from these ornaments will go to my NeedleArtisans of NW Indiana group and the quilt guild. 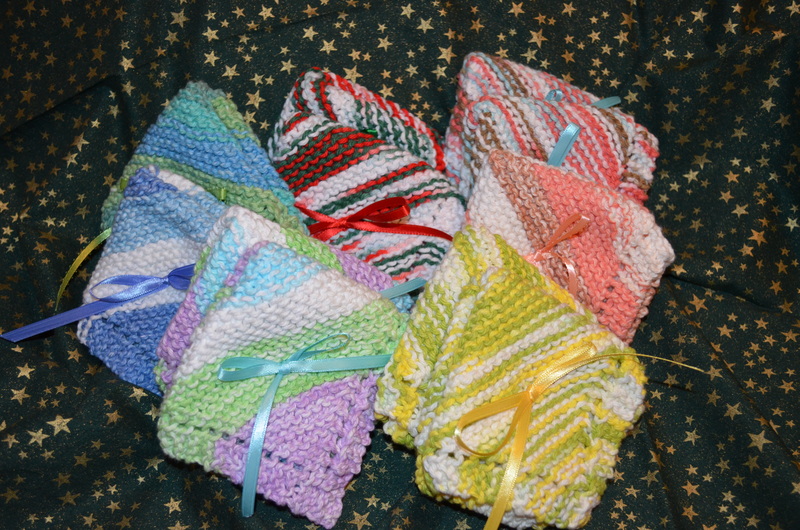 The same goes for the cotton kitchen washcloths I made. I would like to make more items, but my own projects seem to be suffering with all the things I made for the Boutique. So I will have to call it quits for the boutique items I think. 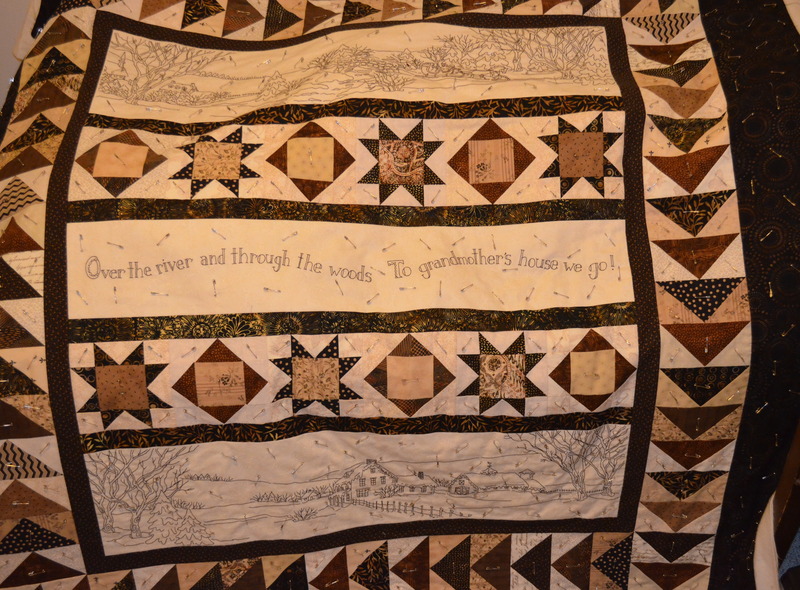 And last but not least of my projects, I have my “Over the River and Through the Woods” quilt prepared for quilting. The three picturesque center panels are all hand embroidered. I plan to machine quilt this one myself. I don’t consider myself a good home machine quilter, but it’s too pricey to have one’s quilts quilted professionally. I like to say “I DID IT MYSELF” anyway. And some quilts just don’t warrant the weeks and weeks of hand quilting. Besides, I still have my yellow whole cloth one on my quilt frame. It’s almost done! In between all the sewing, life things happened….a couple of wakes and funerals….a shower and a wedding….a week’s getaway for DH and myself…. several lunches with friends….a trip to the International Quilt Show in Chicago….quite a bit of gardening upkeep….an unexpected reunion with my three siblings (some who live quite far away)…and the usual everyday things. I very much enjoy my retirement….and love to sit and “veg” occasionally with a good book or my trusty computer seeing what’s new in the needlework and quilting world. Here are two gifts I made and finally completed for a Pay It Forward. 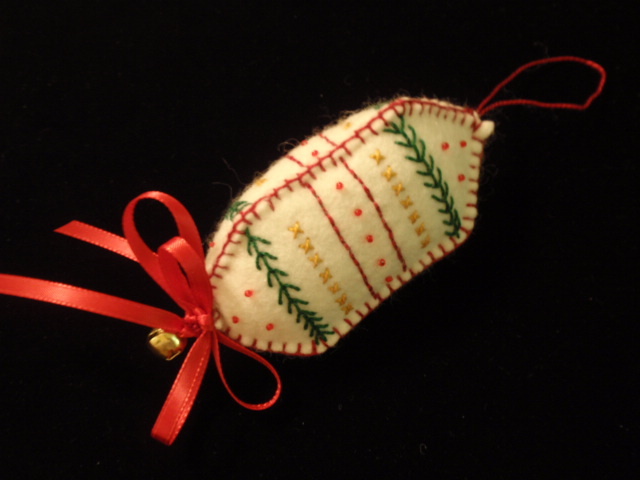 Last Fall I received a Pay It Forward award (a lovely temari ball) from Jane at World Embroideries and now after eleven months, I have finally sent my Pay It Forward awards to the two people who won them on my blog. For Anne at Nanouanne, I made a needlework biscornu. I forgot to take a photo of the biscornu I made, but Anne took a lovely photo of it and she is letting me use her photo for my blog. 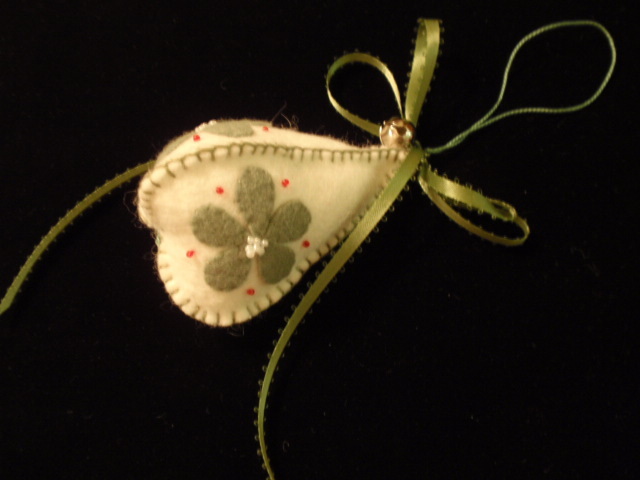 And for Karol at Rosebud’s Stitching I made a small Amish Friendship Basket Wall Hanging. I forgot to take a photo of Karol’s finished gift as well, but here is a photo of one exactly the same as I made for Karol…only Karol’s had a different binding. I’ve been working a lot without much time for sewing. Actually I wake up at 4 AM and get some sewing done before I go to work. 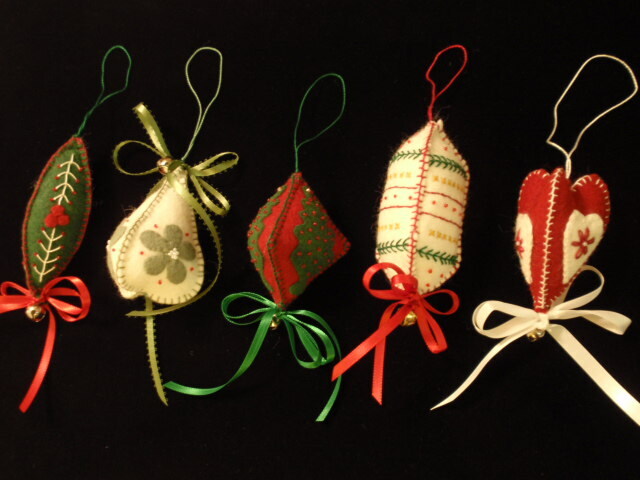 I think I am a bit tired…but I managed to do these Christmas ornaments. They are from a pattern by Indygo Junction. I haven’t done a lot of it, but I love working with wool. I have been collecting it for years hoping to do something fun. Aren’t they just adorable. I think I will save them for gifts for the holiday season. 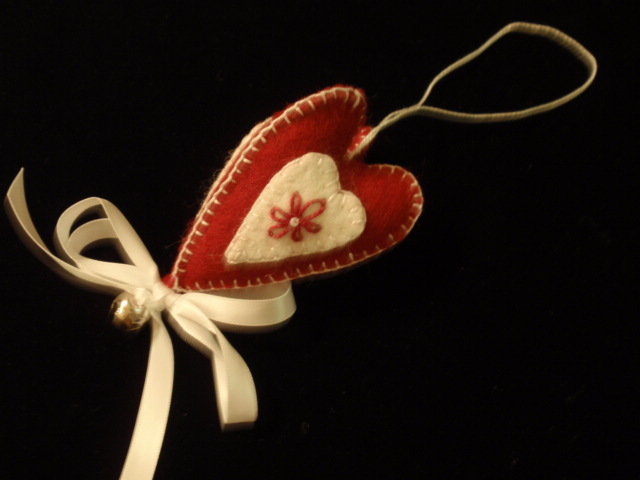 The embroidery on this one didn’t take much time and it really adds a lot to the ornament! 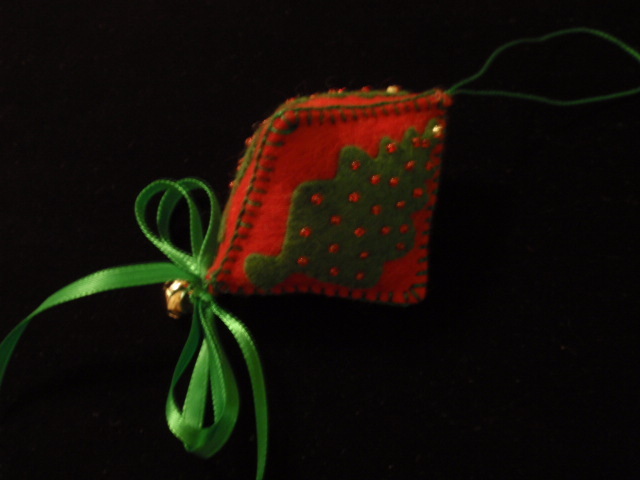 The little Christmas tree has beads for ornaments and a tiny silver bead to top the tree. 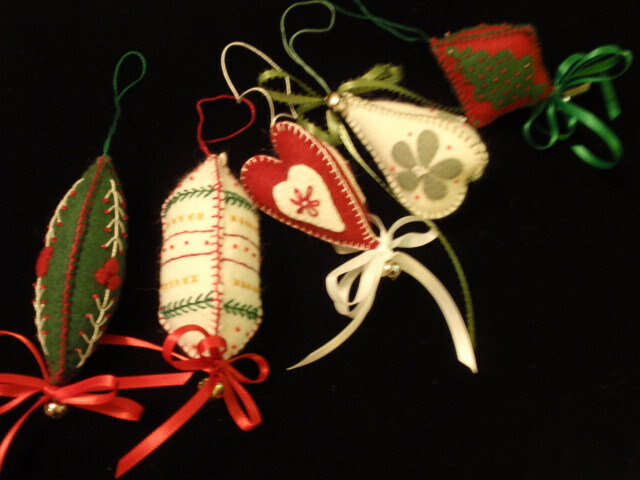 Each ornament has a “jingle bell” attached to the ribbon. 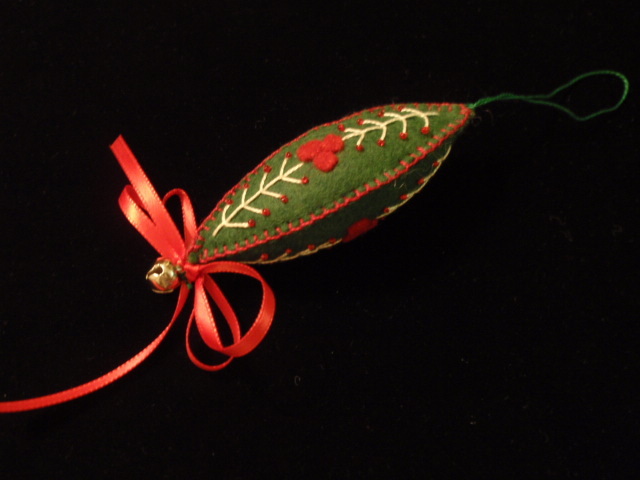 On second thought…I think perhaps that this Mistletoe ornament might be my favorite. 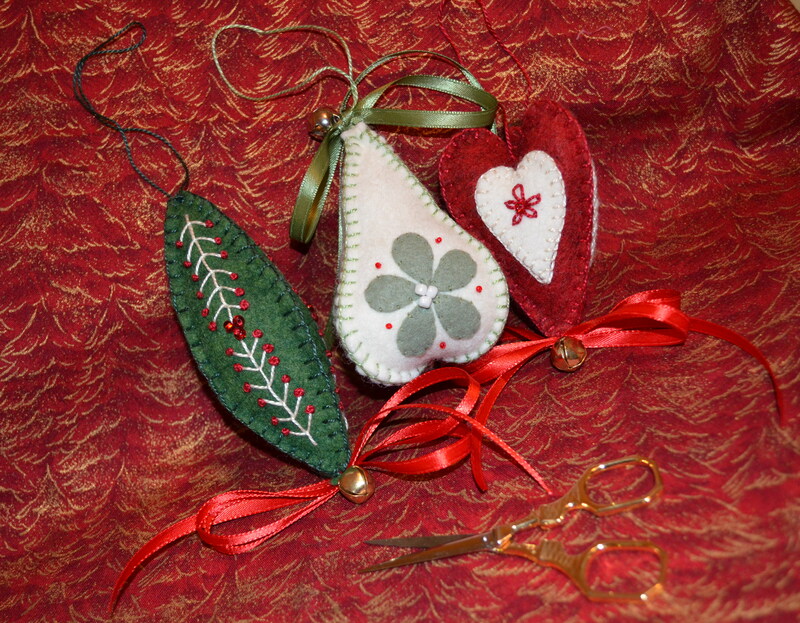 When I was a young girl, I always made sure I had mistletoe around at the holidays for the all the gentlemen who might pass through our doorway! What do you think? Perhaps it is hard to choose a favorite. But I think they will make delightful gifts this year. Glad I spent those early mornings sewing.